Trouble sleeping at night? Do you wake up during the night, only to toss and turn for hours? Approximately 70 million Americans suffer from sleep disorders. American spend over $2 Billion on prescription drugs each year to help them sleep. Dr. John De Cotiis will show you how vitamins, exercise and other natural remedies can treat the cause of your sleeping problems and say goodbye to those sleeping pills. Proper sleep is an integral part to living a happier and healthier lifestyle. Lack of sleep can lead to many problems including weight gain, stress, lower immunity, anxiety and much more. At De Cotiis Chiropractic Wellness Center, Dr. John De Cotiis offers consultation on how you can take the proper steps to getting a restful nights sleep. 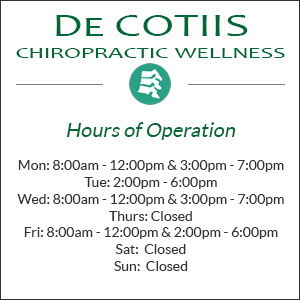 When you visit our clinic, Dr. De Cotiis will take the time to learn your individual situation in order to cultivate a personalized program to meet your needs. He has lead many patients down the road to proper lifestyle choices which promote more energy, weight loss, sharper mental clarity, reduced stress and much more. Contact our office today to set up you consultation with Dr. John De Cotiis.